3CMA, the City-County Communications and Marketing Association, is a dynamic network of professional public communicators and marketers from all over the nation. The organization's annual Savvy Awards competition recognizes outstanding local government achievements in communications, public-sector marketing and citizen-government relationships. Hall County competed against hundreds of entries from governments across the country. 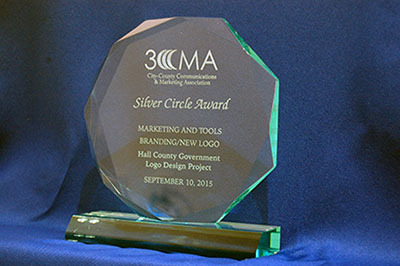 Hall County was presented with the Silver Circle Award for their logo design project, which was completed last year. "The logo design project was truly a grassroots effort, launched with the input of citizens and employees," Hall County Administrator Randy Knighton said. "We are honored to be recognized for the thorough and cost-effective process we used to produce a quality brand that truly exemplifies Hall County's unique assets." The logo features two flowing blue stripes, a soft green arc and the image of a rising yellow sun, complete with "rays" in the shape of mechanical cogs. Each element of the logo highlights a distinct characteristic of Hall County. "The blue streaks represent Lake Lanier, an important feature of Hall County's landscape and overall quality of life," said Katie Crumley, public information officer for Hall County Government. "The blue lines also resemble roadways, giving a nod to the infrastructure Hall County provides and maintains for its citizens." Crumley said the green arc is reminiscent of Hall County's location at the foothills of the Blue Ridge Mountains and the area's rich agricultural heritage. The rising sun represents the county's current state of growth and potential for economic development. "The mechanical cogs seen on the outside of the sun also pay tribute to the fact that Hall County is moving forward and will continue to grow and thrive in the future," she said. The judges for the 3CMA Savvy Competition praised Hall County for citizen and employee involvement and their impressive brand identity standard guide. Hall County began the process of creating a new logo in 2013 with a countywide survey available on the county's website, hallcounty.org. The survey asked for feedback from Hall County Government employees and Hall County residents about what images, colors, fonts and more should be incorporated in the new design. The survey also asked whether or not the respondent would be interested in participating in a focus group dedicated to expounding on the survey responses. Two focus groups, one involving citizens and one involving Hall County Government employees, were held to garner more input on the logo design and slogan. Following the collection and analysis of citizen and employee input, Forum Communications, a local full-service strategic marketing agency, was hired as a consultant for the actual design of the logo. Using input generated from citizen surveys and focus groups, several logo options were developed. Those options were revised and narrowed down by elected officials and Hall County staff until the final logo design was complete. The new logo design and slogan were a part of a larger rebranding effort, which included a redesign of the county website, the development of internal organizational values and the release of a Hall County promotional video.